At last, Get to the pub.com has made it out of Sheffield for the first time since the Christmas break. Not counting the football. I know it’s only a couple of weeks but all that snow made it seem a lot longer. A big welcome to any new readers who are here after the Rutland Arms (Sheffield) post was put on somebody’s Twitter page or something last week. Pull up a chair – I’ll bring you a nice pint of ale, and you can explain to me how all that Twitter gubbins works. I dunno, I preferred it when the internet ran on steam. Speaking of which, sorry if this weekly round-up runs out of puff a bit towards the end. I’ve got the poorly. Too much beer, probably. Don’t try this at home, kids! 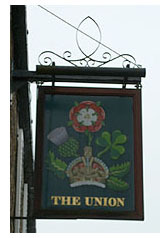 Union Hotel, Union Road, Sheffield. When I’m working nearby, and it’s not so busy that I can’t nip to the pub at lunchtime, I enjoy the odd hour in the Union – as suburban a pub as you could wish for, ensconced deep in the dreaming, tree-lined lanes of Nether Edge. Not that its lunch is very appealing to this meat-dodger – this is the Daily Mail and Telegraph-reading end of Nether Edge, not the Guardian-reading end – and I’m forced to suffice myself on a forlorn veggieburger and the scantest handful of chips. But it’s a wonderfully friendly old joint with a nice interior, and a great place to settle down with a book and enjoy the people. Today a posh, hesitant man is ordering a cooked breakfast – it’s nearly 1pm and I’ll guess he’s a widower – and is drawn very slightly into banter with the two sociable old boys at the end table, who entertain each other and the Union’s resident dog, black and stout and compact, who roams the pub like a pike on a riverbed. I say goodbye to the old boys with two pints of Landlord in my belly, regretting not having nattered while I could. But I never leave the Union without a smile on my face. It always seems much quicker walking back to work from the Union after lunch than walking to the Union from work before lunch. Doctoral research would be fully justified. Lescar Hotel, Sharrow Vale Road, Sheffield. Another lunchtime pint, this time with a big group from work instead of on my own, and in a pub that enjoys semi-legendary status over this side of the city (although it’s also one of many Sheffield pubs which people enjoy saying aren’t as good as they used to be). Surprisingly quiet this weekday lunchtime, though – other than the ten or so of us clustered around two tables, each of us waiting for food and waiting for someone else to risk a second pint so we can have one without looking bad. Nobody does, which is mildly annoying, as I’ve necked most of my Moonshine dead quick and have to nurse the final third of it for half a bloody hour. The group knocks some agreeably smutty banter about for a while before the chatter devolves to the two tables. From a pretty lavish menu I’m eating something called a Tuscan beancake, with some roasted root veg and rocket and a lovely spicy sauce. Champion. Abruptly, and much, much too soon, we all go back to work. Rutland Arms, Rutland Street, Grimsby (featured here). A mournful pre-football pint as we contemplate the prospect of a 19th consecutive league match without a win. Sure enough, the Mariners go on to boss the game against an awful Cheltenham side which plays nearly half of it with ten men, only to draw 0-0. Mark and Richard spend much of our time in the Rutland discussing how to pluck a partridge. Anything but relegation. The Tap and Tumbler, Wollaton Street, Nottingham. Populated by an odd mix of half ageing punks and rockers, and half very straight and quite hard-looking middle-aged couples, the Tap and Tumbler is a basic city centre pub with one large room. It’s rough and ready and loud and alive. I go to the toilet and someone’s puking in the cubicle. Not my favourite pub in the world, but it has a kind of rowdy, blaring soul about it – which is more than most of yer chain pubs can offer, of course – and again, I get the feeling it’s a place that means a lot to some folks. Sheffield Tap, Sheffield (featured here). I get off the train back from Nottingham and come in here to meet my mum and her other half, Jim, who are visiting us this afternoon. There’s a BrewDog festival on this weekend – a brewery whose virtues Barm has been espousing – so I have a pint of Punk IPA. There’s no visible indication of its strength but it’s full-bodied for a pale with a lovely and robust sprinkling of fresh, flowery flavours: two qualities that bring it very close to Thornbridge‘s magnificent Jaipur. A dark brown ale called 5am Saint goes down well too. The Fat Cat, Alma Street, Sheffield. 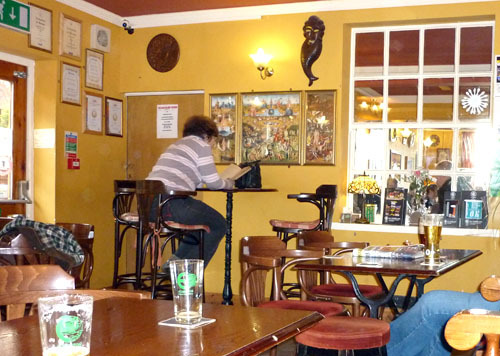 When I talk about the cosy front room feel of Sheffield pubs, the Fat Cat – another of the Kelham Island pubs that’s picked up a stash of CAMRA awards down the years – is always uppermost in my mind. One thing that does bother me about the pubs of Sheffield is the way a once tremendous choice of vegetarian pub food has been stripped down to a sad and tokenistic parade of dreary pasta and veggieburgers that’s barely any better than you could find in ordinary cities – but the Fat Cat has kept the faith brilliantly and doesn’t let us down today, with a wonderfully hearty squash and mushroom pie, vegetables and gravy. Bless them forever. The Tap and Tumbler was my first “local” in Nottingham, Pete. It used to have a pretty amazing jukebox and some pretty amazing goth girls. Ne and Sally Pye used to go in there a lot and get drunk when she worked for Earache. I took my first wife for our first date together in there and spilled a pint all over here. brewmonkey – yes, been in the Harlequin but only once or twice; I keep meaning to include it on a future visit around Kelham Island or Shalesmoor. I’m sure it’ll feature here at some point! Wasn’t it the people who run the Harlequin who were thought to be taking over the Shakespeare but then it didn’t work out?